THE AIM OF THE PLAYERS: to achieve a hand whose points total nearer to 23, but without exceeding 23. SIMILAR GAMES: 21, Black Jack, Pontoon. AMOUNT OF PLAYERS: from 2 to 8. TIME TO PLAY: 2 - 7 minutes. CARDS: 64 cards (withdraw 8 cards - any 4 black and 4 red cards from generation #6 of Six Generations 72-cards deck). 2. For the first round, players choose any player to become a dealer, but for each next round the winner becomes a dealer. 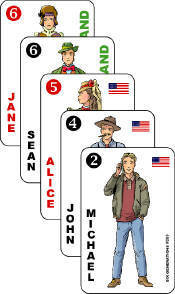 DEALING: From top of the deck, face down, clockwise, 4 cards to each player at a time. RULES: After receiving four cards, each player tells dealer, if more cards (any amount) wanted, or not. A player may ask for one card several times. The dealer forward the cards, until all players stop asking. The player, who gets 23 scores, is a winner. If several players have 23 scores, they split the prize. If no one has 23 scores, then the player, who has more scores, but not exceeding 23, is the winner, and if several players have the same scores, they split the prize. The players, whose scores are more than 23, are always losers. If all players have more than 23 scores, nobody is a winner, and game is played again with the same dealer.